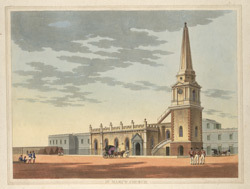 'St Mary's Church, Fort St George, Madras'. Drawn and engraved by J.W. Gantz, Vepery, 1841.
bl.uk > Online Gallery Home	> Online exhibitions	> Asia, Pacific and Africa Collections	> 'St Mary's Church, Fort St George, Madras'. Drawn and engraved by J.W. Gantz, Vepery, 1841. Coloured aquatint with etching by J.W. Gantz of St Mary's Church in Fort St George at Madras, dated 1841. St Mary's Church was built between 1678-80 by Streynshman Master in Fort St George. It was the first Catholic place of worship in Madras and represents the oldest Britsh building in India to survive. It has three aisles with semi-circular roofs and a Neo-Classical tower topped with an octagonal lantern. The church was almost entirely rebuilt in 1759 after being damaged in a siege.